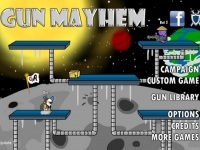 Gun Mayhem is a fighting game where you are required to choose an arena, an opponent and then starts shooting. Now as a player you are required to fight against the AI opponent or a human opponent. You have to use arrow keys to control your characters, and the left, and right brackets are needed, to shoot and start throwing bombs. In order to fire here, you need a sniper rifle, bomb for throwing to your enemies, and guns. It is a high-octane arena style action packed war games that are full of action thrillers that are sure to lure your heart all at a go and provide you with full entertainment and fun. In this game, controls for players are from key 2-4 that can be edited in the option menu. Within a short time, this game has gained such a response in the web community, mainly for its stunning graphics and action packed thrilling experience. You can also play this game with your friends and play against them to kick off your scores in this gaming option. Gun Mayhem supports up to four players at a time and here in this game you can utilize over 60 different types of weapons and firearms. Apart from that you are getting 12 various maps for fighting down your enemies and four unique game play mode for playing the game better. Explore a big city and gain more points and money to proceed to the next level. Game collection with 80 best free games. Destroy opponents to get scores as much as possible.